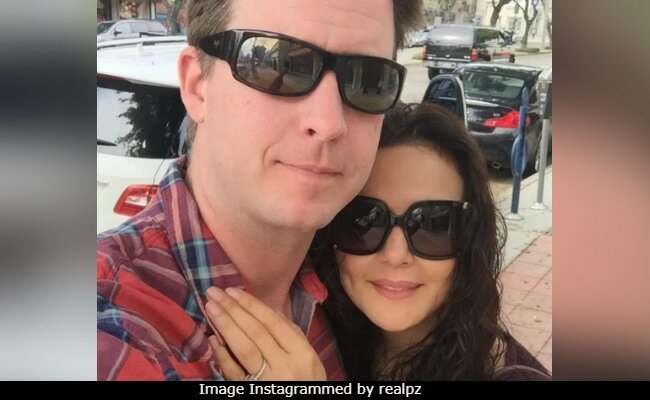 Preity Zinta has the most adorable anniversary wish for her husband Gene Goodenough. The actress shared a super cute selfie on Instagram, and wrote a cute little note addressed to the husband on the occassion of their second wedding anniversary. "A lover, a partner, a husband, a best friend. I can't believe that I have all rolled into one! Thank You for always being so wonderful & yes, you're the only one I want to annoy for the rest of my life," wrote the actress. She followed up her post with tags like "Happyweddinganniversary", "#7yearsstrong" and her signature "ting." Preity's followers on Instagram are thrilled to have chanced upon the adorable post - "Beautiful picture of you both," wrote one user, while another added: "My favourite couple! You look fab together, boss! Stay Blessed!" Preity Zinta and Gene Goodenough got married in Los Angeles in February 2016. Later in May, she treated her friends and colleagues to a glitzy bash in Mumbai. In a Twitter chat earlier, Preity had revealed that she dated Gene for five years before the wedding, something which she also mentions in the tags added to her latest post. This is how Preity celebrated her 43rd birthday with the "Pati Parmeshwar" in Los Angeles. Preity had also rung the New Year in with her husband in tow, and posted adorable photos from the bash. "Happy New year with a dash of Love," is what she captioned her selfie with the hubby. Preity Zinta travels between US and India throughout the year and was last seen in 2013's Ishkq In Paris, which she also produced. She is awaiting the release of the much delayed Bhaiyyaji Superhitt, which went in floors in 2014. Happy Anniversary, Preity Zinta and Gene Goodenough!